Adobe has finally updated their Flash Player Version Penetration statistics page with details for December 2008, and things are looking good. Just how good? Well, basically, Flash 10 has enjoyed the fastest adoption rate of Flash since it has been introduced, having now a 55.9% penetration on mature markets roughly two months after it has been released. I’m actually quite surprised that my own prediction of 90% penetration in 6 months for Flash 10 – previously it would take one year for Flash to reach that mark – seems more realistic now. That, coupled with other recently announced numbers like 100 million Adobe AIR installations and a reported 80% market share on online videos, make the future look pretty bright for the Flash platform. 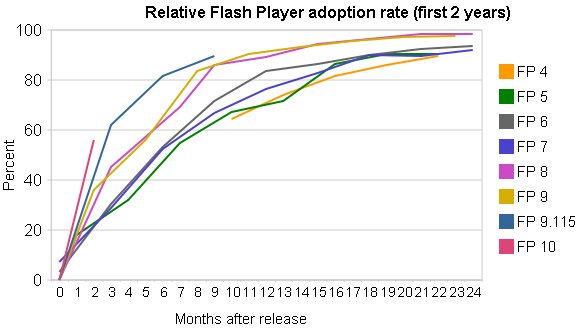 And let’s not forget the fact that, even with current penetration numbers aside, the adoption rate of a certain competing technology is vastly inferior to Flash’s (click on “Line” to see how each different version of each platform has been performing, then compare Flash 10 and SilverLight 2); while SilverLight is obviously gaining some penetration, it seems sponsoring certain exclusive online video offerings isn’t doing as much to the platform as one would think it would. Finally, strangely enough, Flash Player 9.0.115 (the first to include h.264 video support and some other features like hardware scaling of fullscreen content) is not featured on the official penetration statistics anymore, and even the old numbers have been removed from the tables. I guess that’ll become irrelevant pretty fast – it already was at 90% on september – but historically, it’d make sense to still list them there. Notes: the above graphic was created with data gathered from past updates of the Flash penetration statistics pages. You can access the full data set here (or click the image) – it also includes a chronological graphic. Some version lines start with a penetration rate higher than 0% at month 0 because it has been released the same month the statistical data was gathered. Due to this, consider some error margin translation of around 15 days (left or right) for each line. Zeh, thanks for pulling together those archives together into visual form… I hadn’t looked at it that way before!